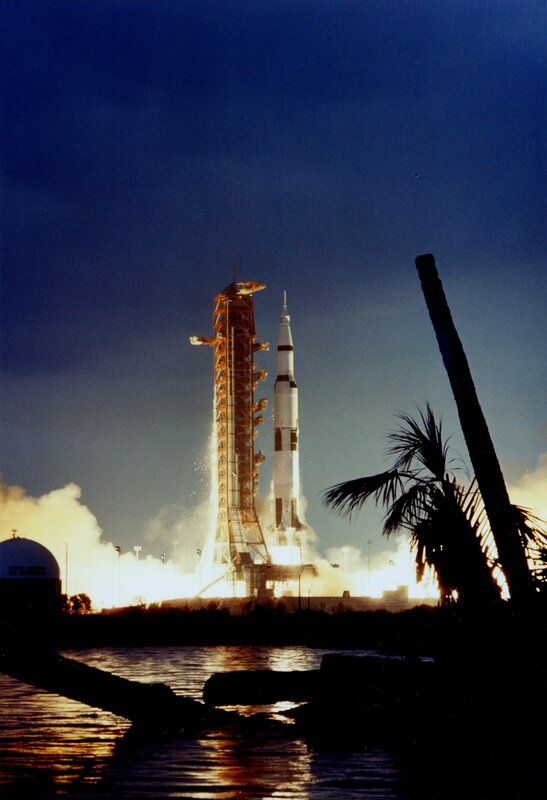 31 January 1971, 04:03:02 a.m., Eastern Standard Time: Apollo 14 (AS-509) lifted off for The Moon from Space Flight Launch Complex 39A, Kennedy Space Center, Cape Canaveral, Florida. 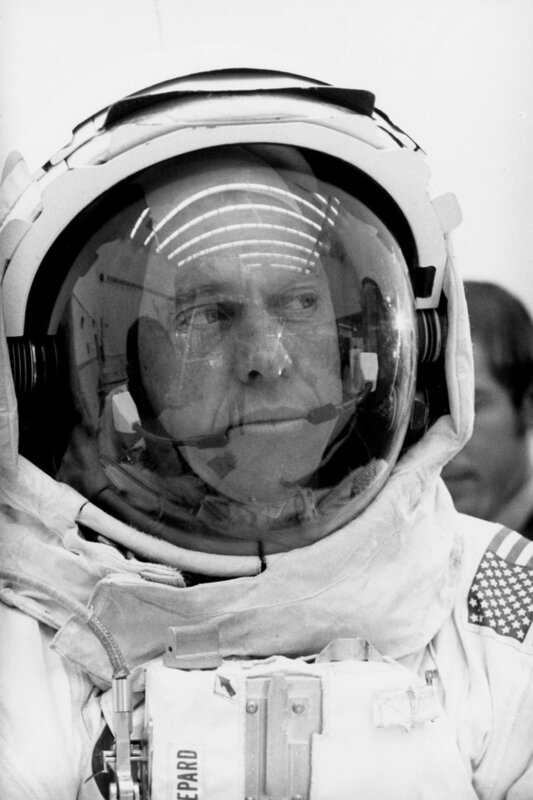 The Mission Commander was Captain Alan Bartlett Shepard, Jr., United States Navy. 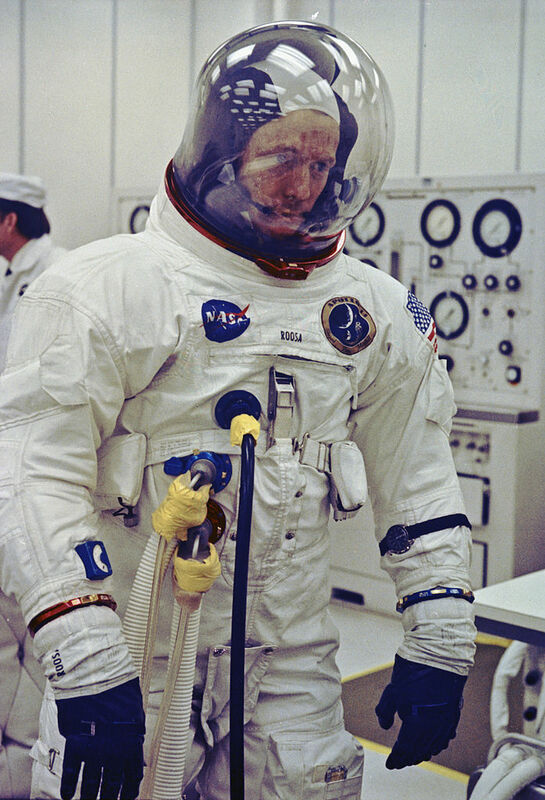 The Command Module Pilot was Colonel Stuart Allen Roosa, United States Air Force, and the Lunar Module Pilot was Captain Edgar Dean Mitchell, Sc.D., United States Navy. Their destination was the Fra Mauro Highlands. 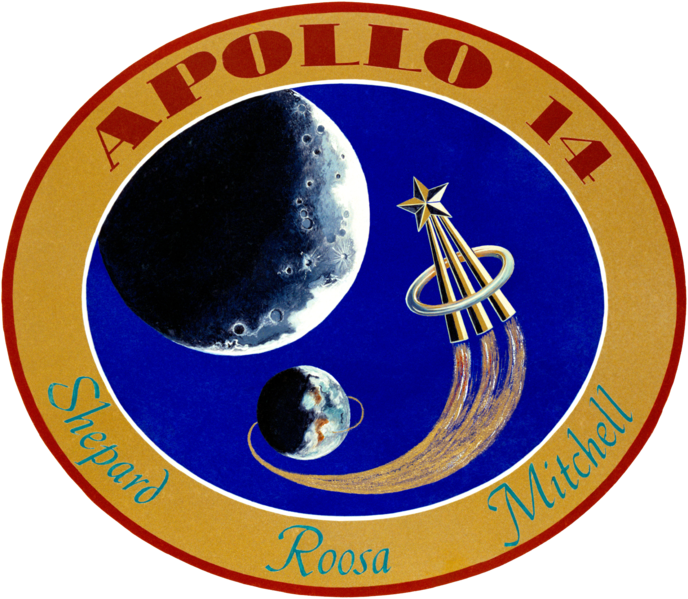 Apollo 14 was the eighth manned mission of the Apollo Program, and the third to land on the surface of the moon. 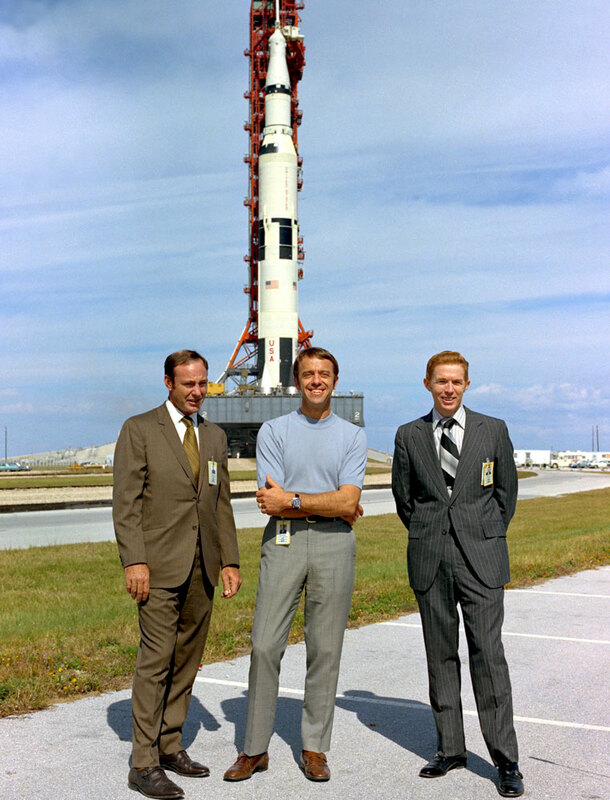 Alan Shepard was the first American astronaut. He flew into space aboard a Mercury spacecraft, Freedom 7, launched from Cape Canaveral by a Redstone rocket, 5 May 1961. Mitchell and Roosa had not flown in space before. This would be their only space flight. The Apollo Command/Service Module was built by the Space and Information Systems Division of North American Aviation, Inc., at Downey, California. The SPS engine was an AJ10-137, built by Aerojet General Corporation of Azusa, California. It burned a hypergolic fuel combination of Aerozine 50 and nitrogen tetraoxide, producing 20,500 pounds of thrust (91.19 kilonewtons). It was designed for a 750 second burn, or 50 restarts during a flight. The Saturn V rocket was a three-stage, liquid-fueled heavy launch vehicle. Fully assembled with the Apollo Command and Service Module, it stood 363 feet (110.642 meters) tall. The first and second stages were 33 feet (10.058 meters) in diameter. Fully loaded and fueled the rocket weighed 6,200,000 pounds (2,948,350 kilograms). It could lift a payload of 260,000 pounds (117,934 kilograms) to Low Earth Orbit. The first stage was designated S-IC. It was designed to lift the entire rocket to an altitude of 220,000 feet (67,056 meters) and accelerate to a speed of more than 5,100 miles per hour (8,280 kilometers per hour). The S-IC stage was built by Boeing at the Michoud Assembly Facility, New Orleans, Louisiana. It was 138 feet (42.062 meters) tall and had an empty weight of 290,000 pounds (131,542 kilograms). Fully fueled with 203,400 gallons (770,000 liters) of RP-1 and 318,065 gallons (1,204,000 liters) of liquid oxygen, the stage weighed 5,100,000 pounds (2,131,322 kilograms). It was propelled by five Rocketdyne F-1 engines, producing 1,522,000 pounds of thrust (6770.19 kilonewtons), each, for a total of 7,610,000 pounds of thrust at Sea Level (33,850.97 kilonewtons). These engines were ignited seven seconds prior to lift off and the outer four burned for 168 seconds. The center engine was shut down after 142 seconds to reduce the rate of acceleration. The F-1 engines were built by the Rocketdyne Division of North American Aviation at Canoga Park, California. The S-II second stage was built by North American Aviation at Seal Beach, California. It was 81 feet, 7 inches (24.87 meters) tall and had the same diameter as the first stage. The second stage weighed 80,000 pounds (36,000 kilograms) empty and 1,060,000 pounds loaded. The propellant for the S-II was liquid hydrogen and liquid oxygen. The stage was powered by five Rocketdyne J-2 engines, also built at Canoga Park. Each engine produced 232,250 pounds of thrust (1,022.01 kilonewtons), and combined, 1,161,250 pounds of thrust (717.28 kilonewtons). The Saturn V third stage was designated S-IVB. It was built by Douglas Aircraft Company at Huntington Beach, California. The S-IVB was 58 feet, 7 inches (17.86 meters) tall with a diameter of 21 feet, 8 inches (6.604 meters). It had a dry weight of 23,000 pounds (10,000 kilograms) and fully fueled weighed 262,000 pounds. The third stage had one J-2 engine and also used liquid hydrogen and liquid oxygen for propellant. The S-IVB would place the Command and Service Module into Low Earth Orbit, then, when all was ready, the J-2 would be restarted for the Trans Lunar Injection. Eighteen Saturn V rockets were built. They were the most powerful machines ever built by man. 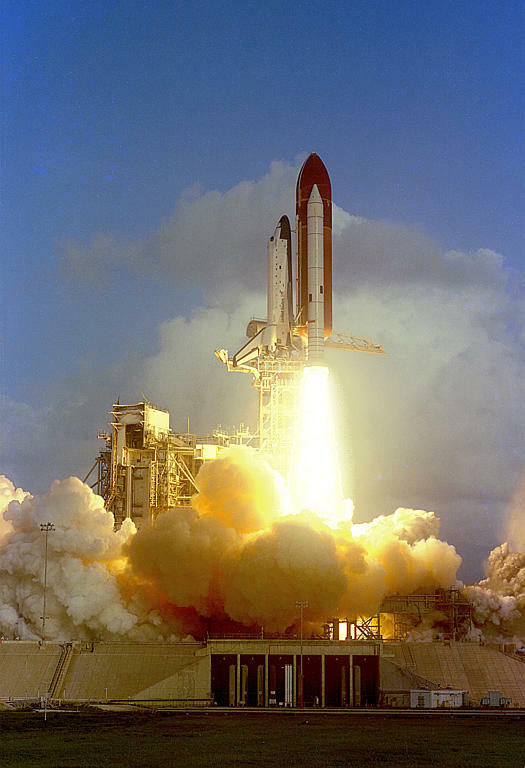 18 June 1983: At 7:33:00.033 a.m., EDT, Space Shuttle Challenger (OV-099) lifted off from Launch Complex 39A at the Kennedy Space Center, Cape Canaveral, Florida, on mission STS-7. This was Challenger‘s second flight and it carried a five-person crew, the largest aboard a single spacecraft up to that time. Commanded by Robert L. Crippen on his second shuttle flight, STS-7 was to place two communications satellites in orbit and to deploy an experimental pallet with multiple experiments. Aboard was Mission Specialist Sally Kristen Ride, Ph.D., America’s first woman to fly in space. She operated the Shuttle Remote Manipulator System, a robotic arm, to deploy and retrieve satellites. 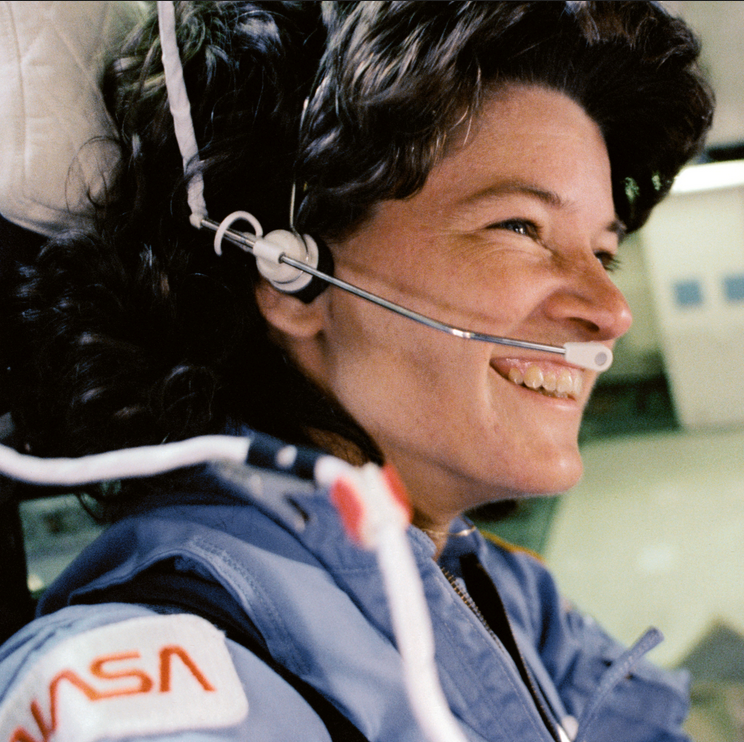 Sally Ride was born 26 May 1951 at Encino, California (in “The Valley”). She was educated in the Los Angeles public school system and then attended the Westlake School for Girls, a private university prep school in the Holmby Hills area of Westwood, California, where she graduated in 1968. Miss Ride then studied for three years at Swarthmore College in Pennsylvania; the University of California, Los Angeles (UCLA); and then entered Stanford University, where she earned bachelor’s degrees in both English (B.A) and physics (B.S.) in 1973. Continuing post-graduate studies at Stanford, she was awarded a master of science degree (M.S., 1975) and then a doctorate in physics (Ph.D., 1978). Dr. Ride was selected as a NASA astronaut candidate in 1978 an underwent a year of training as a mission specialist. While awaiting assignment to a space shuttle mission, she served as CAPCOM (“capsule communicator”) for the second and third shuttle missions. Sally Ride flew aboard Challenger for Mission STS-7, between 18–24 June 1983, with 147 hours of space flight. Her next flight was STS 41-G, also aboard Challenger, 5–13 October 1984, for 197 hours. She was assigned to STS-61M, which was also to have been flown with Challenger, but the mission was cancelled following the destruction of Challenger, 28 January 1986. Dr. Ride served aboard the Rogers Commission investigating the tragic loss of the shuttle, along with physicist Richard P. Feynman, Ph.D., astronaut Neil A. Armstrong and test pilot Chuck Yeager. 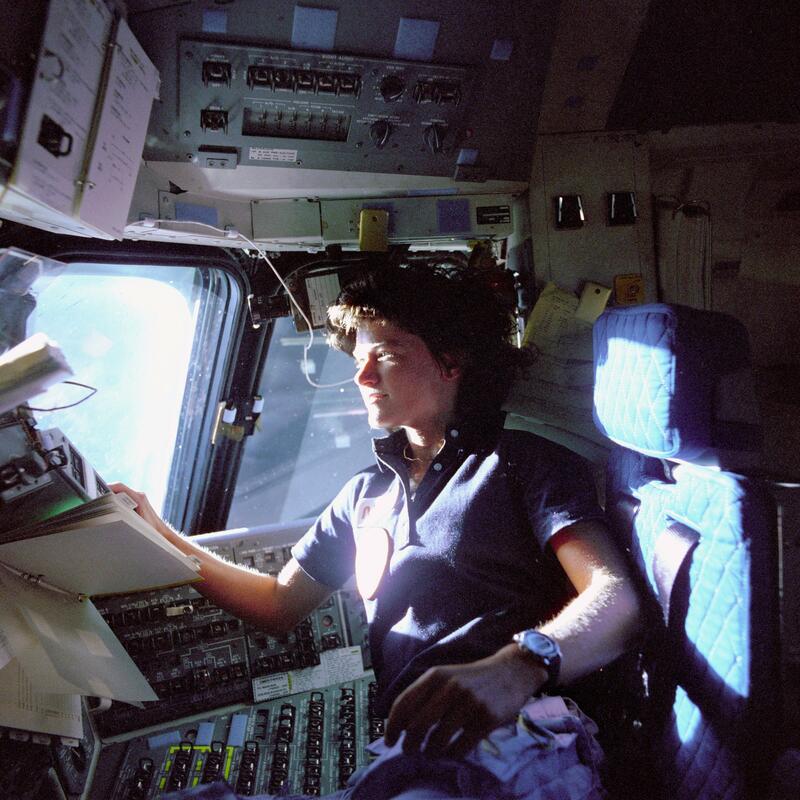 Sally Ride left NASA in 1987 and worked at the Center for International Arms Control at Stanford University, and in 1989, became a professor of physics at the University of California, San Diego. 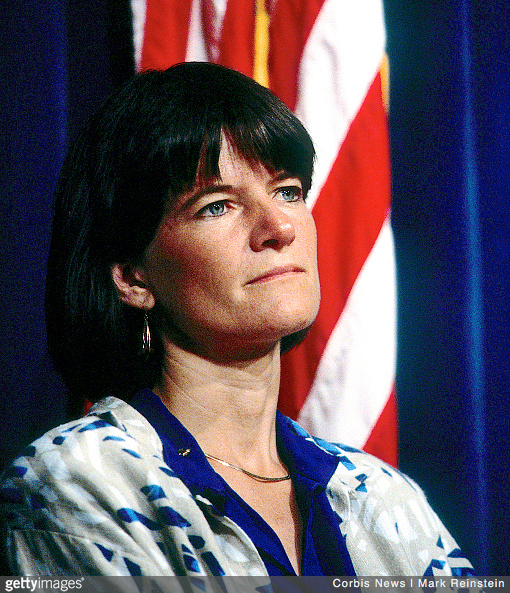 In 2001, she formed Sally Ride Science, an advanced educational program at UC San Diego. In 2003 Ride was appointed to the Columbia Accident Investigation Board. Sally Kristen Ride, Ph.D., died 23 July 2012, at the age of 61 years. She was buried at Woodlawn Cemetery, Santa Monica, California.